Huge Lake Toba (in Indonesia named Danau Toba) in North Sumatra is Southeast Asia's Largest Lake, covering 1.146 sq km, and so far defying efforts to measure its depth-though it is known to be deeper than 450 m. It occupies the caldera of a massive volcano which exploded some 100.000 years ago in the most powerful volcanic eruption ever known. Early man was probably living in Sumatra at the time, and the scale of devastation caused by the explosion is hard for us to imagine-equivalent to hundreds of hydrogen bombs detonating simultaneously. Shortly before the eruption, a giant boil of a mountain grew above the increasing quantities of molten material below. When the solid groound finally gave way, a searingly hot plume of ash was thrown into the sky-its remains can be traced today over an area of 20-30.000 sq km. Around the volcano the ash settled in a layer more than 600 m thick. This eruption set the world record for the quantity of material ejected-some 1.500-2.000 cubic km, compared with just 0,6 cubic km for the much-publicised eruption of Mt. St. Helens in Washington State, USA. Because of the massive quantity of ejecta, the empty cone soon collapsed in on itself to form the world's largest caldera. This became an ancient lake, which was itself destroyed about 30.000 years ago when a second, much smaller eruption occured. 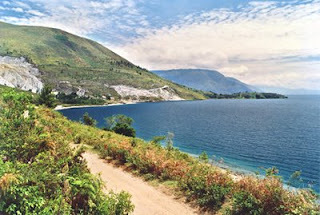 The island of Samosir in the center of the lake, and the lake's eastern shore-the main tourist centers today-are all that remain of the shattered cone. 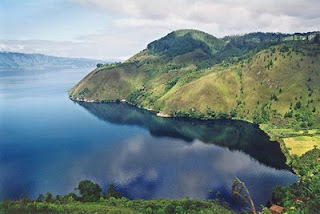 The first Europeans to see Lake Toba (Danau Toba) were a pair of British missionaries, Messrs Burton and Ward, who traveled here in 1824. They were told that the lake level rose and fell like the sea. Although much of the area was already deforested and under rice cultivation, one area on the eastern shore was still covered with jungle. At the time, the lake's outlet was unknown, but eventually it became clear that the Asahan River flowed out through a "spirit-filled" forest at what is now Porsea on the southeastern shore.